Can You Reheat A Baked Potato? What To Do With Your Left Over Baked Potato? The humble potato is one of the healthiest and most versatile foods in the universe. Any flavour you add to this vegetable is a win-win, because it’s so delicious. People not only become addicted to the spud for its yummy factor but also for its good for your body features. The potato has about 110 calories with the skin on. This root veggie is full of potassium, Vitamins C and B6 and packed with magnesium and fiber. Best of all, the potato has zero fat, sodium or cholesterol. So Can You Reheat A Baked Potato? Yes, you can reheat a baked potato by following a few simple rules that food experts have come to enjoy using and swear by. Re-heating this amazing vegetable can be accomplished in a few methods and will still retain its tasty quality. Can You Reheat Baked Potatoes With Toppings? Yes, you can reheat baked potatoes with toppings. However, salsa, cream cheese and other non-dairy toppings might not taste very well when reheated. Butter and cheese won’t be a problem. A fancy, dressed-up potato certainly shouldn’t go to waste just because it couldn’t be eaten right from the oven at the time. Whatever you do, first make sure your left-over baked potatoes are stored properly until you are ready to reheat them. Do not leave first-baked potatoes out on the counter for hours, because the vegetable can develop botulism, even when wrapped in aluminum foil. 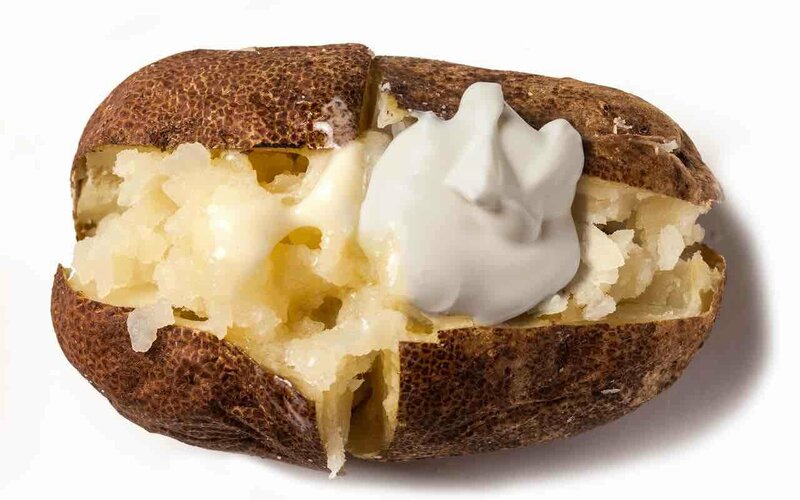 Once a first-baked potato has cooled, remove the aluminum foil you had on it before storing it in the fridge. Instead, wrap it in a fresh piece of plastic wrap, and then place it in the fridge. Take your baked potato with topping and unwrap it, and place it on a cookie sheet lined with parchment paper or foil to sop up any topping leakage. Next, place the cookie sheet in your preheated oven of 350 degrees, and leave the potato there for about 20 minutes to warm up nice and hot. You could try this method in a microwave, but because of a topping involved, it could get messy with leakage, so the oven is your best bet. How To Reheat A Baked Potato Without A Microwave? To achieve a crispier skin, however, most chefs recommend using your oven for the slower re-bake to recreate that favorite firmer texture. This is a super easy method if your baked potato is still whole and uncut. Just place it on the oven rack to re-heat directly. Preheat the oven to 350 degrees, and warm up the potato for about 20 minutes. Some folks prefer to first wrap the spud in aluminum foil for extra crispness. Either way, naked or in foil, this method won’t fail you. You can reheat baked potatoes in a microwave in very little time. 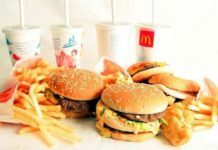 You can heat them up whole or as some food experts like to do, in two portions. Slice the baked potato in half (so it heats evenly), and place a damp paper towel over it, and microwave it on medium until it’s heated through. For a whole potato, wrap it in a moist paper towel, and microwave on high for two minutes and 30 seconds. How To Reheat A Baked Potato In A Toaster Oven? You can reheat a baked potato in a toaster oven. Place the whole potato directly on the rack in a preheated 350 degree toaster oven, and cook for 20 minutes until warmed through. Enjoy your yummy reheated veggies the proper, easy way. Now, you’re in potato heaven. Is Reheating Baked Potatoes Toxic/Dangerous? No, reheating baked potatoes is neither toxic or dangerous when you follow proper guidelines. For example, when reheating a baked potato, make sure your oven is hot enough; that means more than 140 degrees Fahrenheit. Anything below that temperature could cause bacteria to grow. If you use aluminum foil to reheat the potato, remove the foil directly after baking to prevent botulinum bacteria from growing.